This album "Visionary" represents our commitment to expand the chamber music audience, and is a true reflection of the repertoire we present in concerts. It also aligns with our perspective that great music is not exclusive to a particular genre. 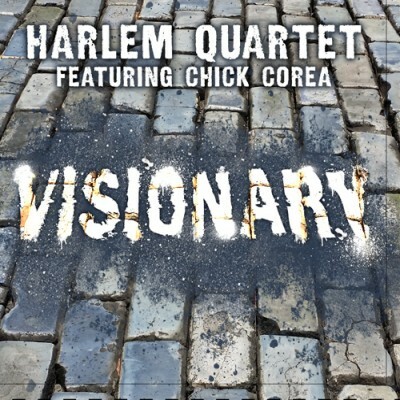 We want to give a special thank you to Chick Corea for this love, support and wonderful collaboration. The 2013 Grammy-winning tune, "Mozart Goes Dancing", was written and originally recorded by Chick Corea for sextet with Gary Burton and Harlem Quartet. Corea created this special quintet arrangement which was premiered at the 30h Anniversary of Music from Angel Fire on August 17, 2013. It was recorded live by Noriko Okabe. "Visionary" was recorded March 24-28, 2014 at Playbach Studios San Juan, Puerto Rico. Ramon Martinez and Carlos Velasquez mastered at 24bit/96khz.